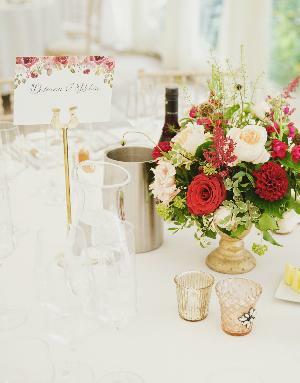 Sophie and James celebrated their gorgeous big day with a burgundy, peach and gold colour scheme. 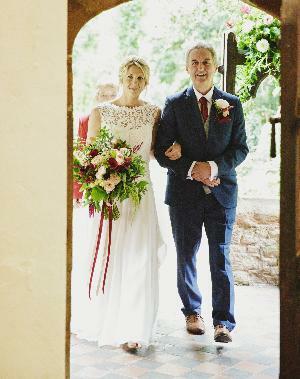 Sophie Knight, 31, married James Rymer, 32, at St. Thomas of Canterbury with St. Peter & St. Paul, Birtsmorton, followed by reception at Birtsmorton Court on 15th September, 2017. 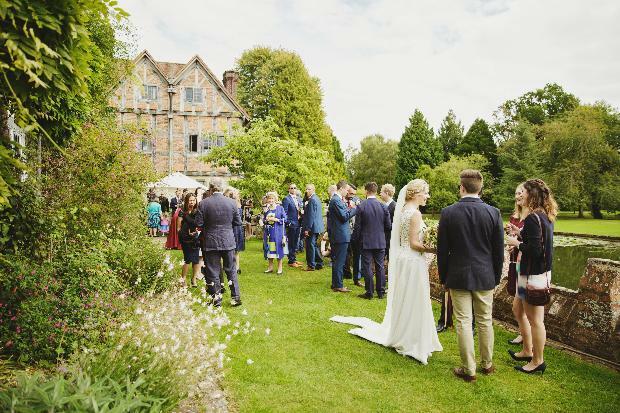 I've worked at Birtsmorton Court as a wedding planner since 2010 and have seen so many beautiful weddings at the venue – I knew our day had to be there. 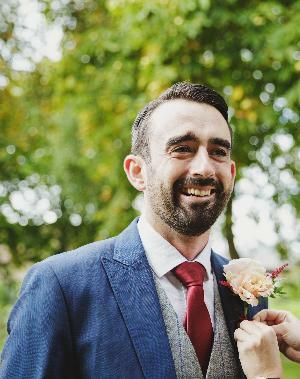 James and the groomsmen donned Peter Posh suits with tweed waistcoats and a tie to match the colour of the bridesmaid dresses – James looked amazing! My gown was Nicola Anne Bridal's Latin design. I knew as soon as I tried it on that it was the one. It had a fitted top and an enormous full skirt and train – I felt very special in it. I accessorised with a cathedral-length veil and a hair vine. My bouquet was an oversized work of art, and I absolutely loved it! 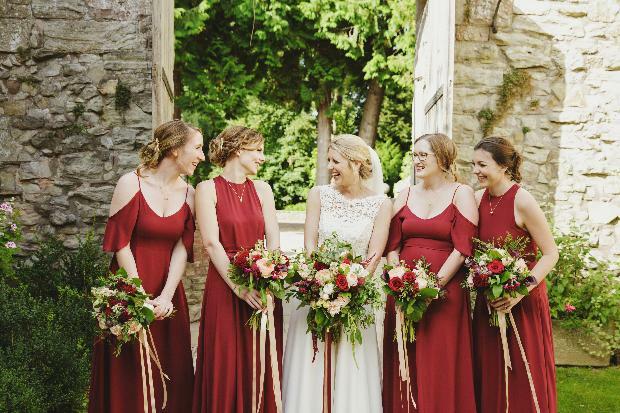 Our four bridesmaids wore floor-length wine-coloured dresses. Two had a racer-style back, and the other two were in a cold-shoulder style. Flowers were a big part of our day as we didn't want to have a lot of other decorations. 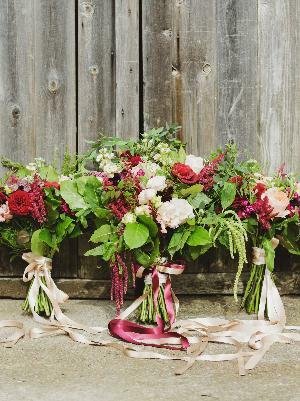 Our florist put together beautiful arrangements with burgundy, peach and pink tones and a lot of greenery. We have always joked about having a wedding like the opening scenes from The Godfather, when everyone is dancing outside. 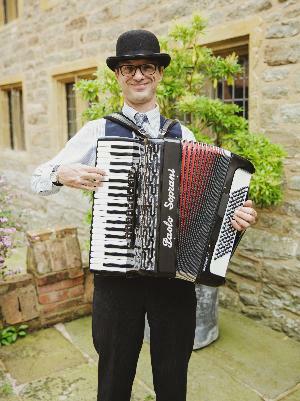 An accordionist was the closest thing we could find to recreate that style of music, and it was the perfect accompaniment to the sunny afternoon. In the evening, we had a live band, The Chip Shop Boys, who were excellent and had everyone dancing all night long! 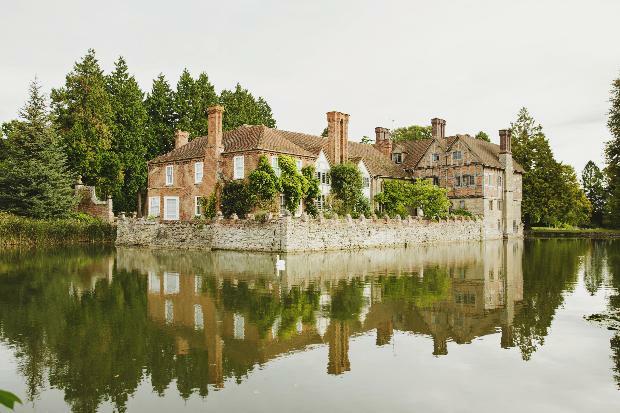 Our drinks reception started on The Terrace overlooking the moat before moving to the White Garden. The second part of the celebrations stand out for us. The sun was starting to go down, the music was playing and plenty of drinks were being served – it just felt like a very special moment. For our table plan, we replicated an idea we saw on Pinterest using a large wooden board, with birch leaves across the top. The table names were things that went together, so the top table was naturally called Jay & Soph. We also had Bangers & Mash, Batman & Robin and Netflix & Chill, to name a few. 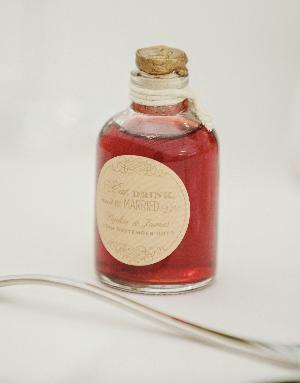 My mum made and bottled several different-flavoured spirits for the favours. She used fruits with hues that matched the colour scheme, so they looked great on the tables with the rest of the décor. 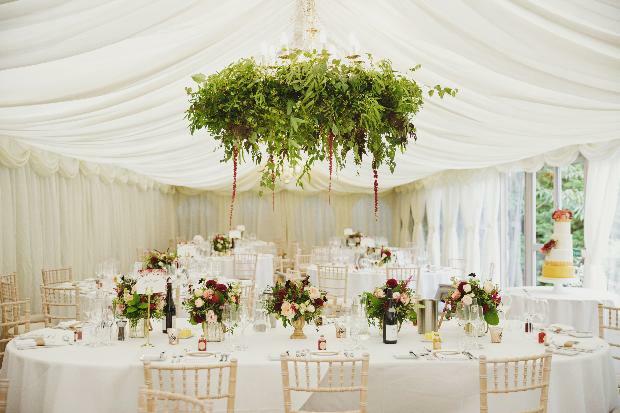 We had blooms in the church, leading the way to the reception, around the marquee, as centrepieces and an amazing suspended masterpiece of greenery above the top table.